I’m also right blown away by the catchy and compelling all-purpose psychedelia of THE LEGEND OF BLACK SIX by power trio The Phantom Family Halo. I say ‘all purpose’ because this stuff is useful and should be available by the vat on prescription, because it’s good for the mental health. I say power trio, but this lot are greedy motherfuckers with a hefty set of auxiliary members. The sound is totally reminiscent of that 1970 period when no fucker could control the number of overdubs, and these guys pass through every stage from The Youngbloods and Kalackakra to a kind of Amon Duul PARADIESWARTS DUUL-informed take on David Voorhaus’ White Noise project via early (very early) Chrome on their way to the proto metal of ‘Electric God In Your Galaxy’. This LP landed unnoticed late last year, like a flying-saucer deep in the woods. Invisible to conventional radar, its phosphorescent after-trail was fortunately spotted by a gaggle of eagle-eyed UFO enthusiasts. Originating from Louisville, Kentucky, a world where acid rock and glam are clearly still king, this sounds like a lost concept album from 1973, though exactly what that concept might be isn’t entirely clear. The title track is a delirious slice of offbeat space-opera that combines elements of Krautrock and early Floyd with the deadpan yet oddly-touching dronesongs of Eno’s 'Taking Tiger Mountain'. 'Lady Blue' is a hazily lysergic Tyrannosaurus Rex style singalong, while 'Black River' takes the restless staccato bass-pulse of Can’s 'Mother Sky' and plays it on a pub piano. 'Saving Civilisation As We Know It' is my favourite: a fabulous glam-stomp fusion of Hawkwind and early Eno, complete with bonkers Bob Fripp style guitar wig-out. Someone please, please get Tony Visconti to produce them. "Debauche hedonism a la early 1970s rock... a party album for excavating your libido. Krautrock lock grooves give way to full throttle Alice Cooper/Black Sabbath moves but mid-tempo Scott Walker fronting early Roxy Music is closest to the core; with occassional flickers of Tangerine Dream synth-glaciers and Marc Bolan bare-bones. Dominic Mario Santo Cipolla also sings in Dead Child (Venom/Judas Priest veined metal band with David Pajo on guitar; ep forthcoming) and plays drums and sings some with Sapat (forthcoming LP/CD on Siltbreeze). 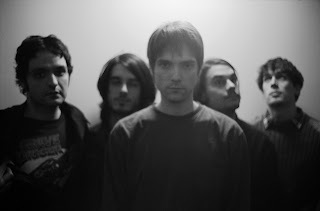 Phantom Family Halo guitarist Michael McMahan was also a touring member of the Slint Reunion band and founding member of The For Carnation along with his older brother Brian McMahan."